Forgot to give my name. I just got the brother embroidery machine that I always wanted. Now that I have it i am overwhelmed, I am afraid of breaking it. There seems like I will not be able to use it. Feel like I need to return it. Sometimes I am very thick headed with directions. Better at seeing someone else using it. Please help me get over this. When embroidering, the feed-dogs must be down! I messed up on an embroidery pattern by not making certain about these! Love your video and enjoy having this particular machine to do my embroidery on! Thank you sew much! At The Brother SE400 Enthusiast blog, I share everything I m learning about my Brother SE400 Sewing and Embroidery machine. 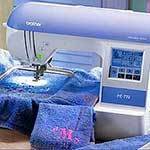 I’m looking to buy a new machine I’m looking at Brothers & Brianna’s I sew tee towels, Quilt, and I want the Emroidery , I’m new to the embroidery.